...or read on below and explore Rakefish.org to learn more about the Rakefish! CLICK HERE to READ MESSAGES FROM JAPANESE STUDENTS! The mission of Sea of No Plastic is to educate people about the global problem of marine litter caused by single-use plastics, by creating and sharing research-through-art learning experiences for students worldwide. Sea of No Plastic is a series of art projects in response to how our culture of disposable plastics has caused severe harm to our ocean planet. 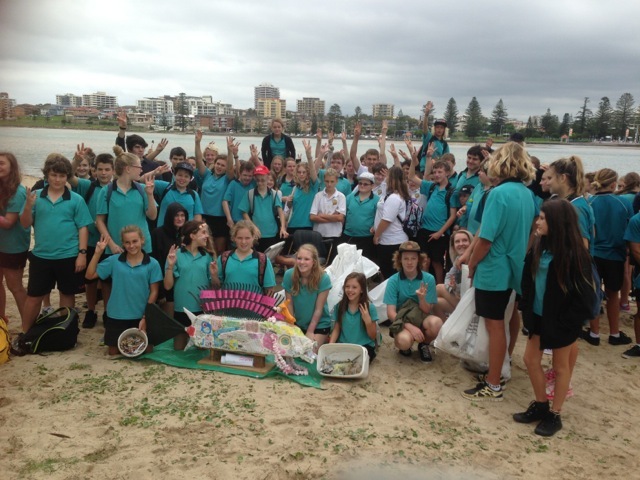 We help students create and share ocean pollution themed sculptures for the purpose of bringing awareness and understanding of the global problem of plastic waste in the ocean. It is designed to be a collaborative, grant-funded research experience for students at participating host schools anywhere on Earth. 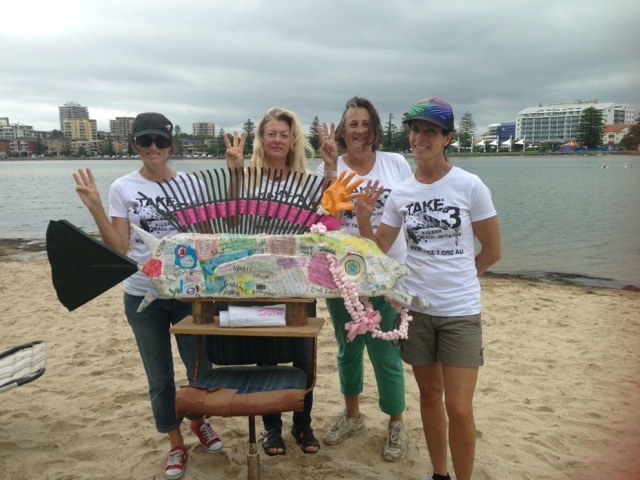 AUSTRALIA 2014: Rakefish with Tuggerah Lakes Secondary students at a beach cleanup hosted by Take 3 in New South Wales. 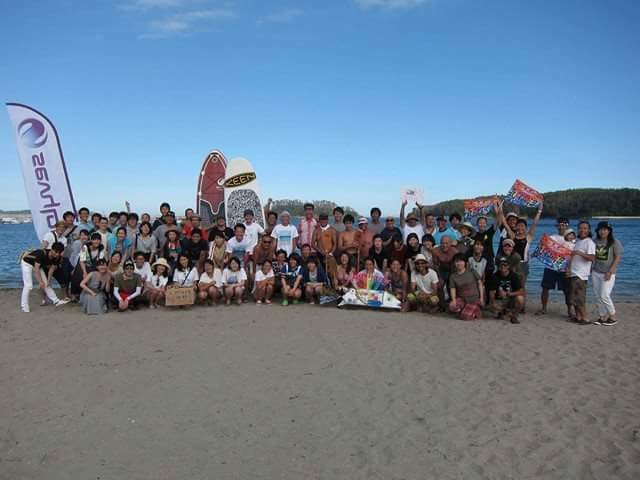 The Rakefish Project is an international marine litter awareness & education initiative, implemented through an interdisciplinary, collaborative research project for upper elementary and secondary school students worldwide. "The future of Planet Ocean lies in the hands of those who are students today. The Rakefish Project is a wonderful example of students educating themselves and others as to what is at stake. In the process they have created a compelling piece of environmental art." The Rakefish was featured on Smithsonian's ocean portal on World Oceans Day, June 8, 2012! 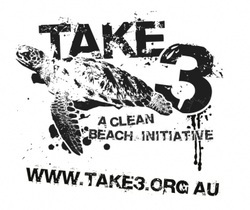 ​'Take 3' is a not-for-profit organisation formed in 2009 that aims to raise awareness of marine debris by encouraging each visitor to the beach, waterway or anywhere else to simply take 3 pieces of rubbish with them when they leave. We also encourage everyone to reduce their unnecessary plastic consumption - and make our lives a little less plastic! The first year of this project was made possible by a grant from the Guilford Fund For Education, Guilford, Connecticut. Until now, there has never been a unified voice for ocean protection in the Mountain States. 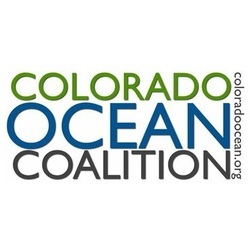 The Colorado Ocean Coalition believes that you don’t have to be near the ocean to care about it. We work with COCO to bring ocean pollution awareness to those who live far from the sea, helping students and their communities learn that their actions and choices do affect the health of the ocean, 1000 miles away. Algalita's Youth Ambassador, Anushka Bhaskar, is also our West Coast Representative for the Project, and has been a consultant with us for over 4 years. The AMRF was founded by Captain Charles Moore, who is credited with the discovery of the so-called "Great Pacific Garbage Patch". Algalita's research focuses on the impact of plastic pollution on the ocean and sea life. We are proud to be working with Algalita to bring awareness of marine litter, and share the vision of ending the flow of plastic pollution from our watersheds to the sea. Our partnership with Marine Money is a great example of how collaboration between conservation and industry groups can work to create a cleaner ocean environment. Press Release. We have partnered with Surfrider Foundation from coast to coast! 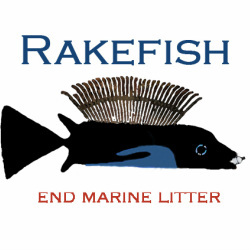 Rakefish spent most of 2013 in SoCal, and presented at many Surfrider beach cleanup events. Our 2 sea turtle sculptures were invited to Surfrider CT Chapter's International Surfing Day 2013 events at Walnut Beach in Milford, Connecticut. Surfrider has chapters all over the world, so try and get involved! We are grateful for the support of our local Interact Club! Thanks to their generous support, we have been able to meet the Rakefish sculpture's schedule demands in Colorado & California from Fall 2012 to Spring 2013.